Workman Publishing Company, 9780761162414, 304pp. It’s the parenting guide for parents who thought they no longer needed one—for parents who worry as their 20-something kids struggle to grow up; who are saving for retirement but now have to reopen the bank of Mom and Dad; who look forward to downsizing but have a boomerang child living at home again. And it’s the parenting guide that says it’s all going to be OK—just step back but stay connected, and don’t forget to take care of yourself. Kids may be taking longer to graduate from college, start a career, marry, have children, but it’s natural. Just as scientists a century ago discovered a new phase in life called adolescence, there’s now another developmental stage, emerging adulthood. According to Dr. Jeffrey Arnett, the world’s leading authority on emerging adults, and his coauthor, Elizabeth Fishel, author of Sisters and mother of two 20-something sons, the time spent in emerging adulthood actually helps kids become happier, healthier grown-ups. When Will My Grown-Up Kid Grow Up? covers every aspect of life for an 18- to 29-year-old, from that first taste of independence at college to that time at the end of the 20s, when the majority of kids are settling down. It explains what grown children are going through—intense self-focus, instability, a feeling of being “in-between” mixed with a breathtaking sense of possibilities—and how parents should deal with these changes, from six ways to listen more than you talk, to money 101 (and why never to use money to control your child’s life), to troubleshooting their failure to launch, to, finally, the dos and don’ts of promoting a successful transition to adulthood. Because yes, they really will grow up. Jeffrey Jensen Arnett, Ph.D., coined the term “emerging adulthood” and wrote the classic book on this life stage, Emerging Adulthood. He is a research professor in the Department of Psychology at Clark University and executive director of the Society for the Study of Emerging Adulthood. He lives in Worcester, Massachusetts. Elizabeth Fishel is the author of Sisters, Reunion, I Swore I’d Never Do That, and The Men in Our Lives, and a journalist who has written for Vogue, O, Good Housekeeping, Parents, More, Family Circle, and other magazines and newspapers. She lives in Oakland, California, and is the mother of two 20-somethings. "For parents who are caught up in the struggle to stay connected while pulling back during their kid's journey to adulthood, this book provides a frank, factual, and fearless look at the road ahead." "Highly readable and informative . 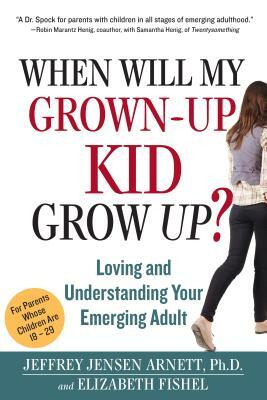 . . A must-read for 50-something parents." "Replete with sage advice and thoughtful observations."